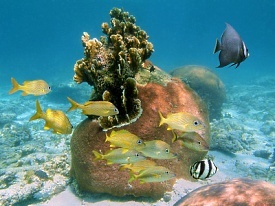 Diving, snorkeling and sea kayaking are just a few of the ways to spend your time in Bimini. This small island is only seven miles long and 700 feet wide and is the perfect place to take a dolphin excursion or go fishing. The island plays host to several fishing tournaments throughout the year. Bimini is the westernmost island in the Bahamas and the closest to the U.S. mainland.